One of the oldest single casks of Royal Lochnagar whisky, gifted to Prince Charles, the Duke of Rothesay, will be sold by ballot later this month for charity. The 30-year-old single malt was originally gifted to Prince Charles to mark the 140th anniversary of the first royal visit by Queen Victoria and Prince Albert to Royal Lochnagar distillery in Royal Deeside in 1848. To mark his 70th birthday, which took place on 14 November, the Prince has requested the cask’s contents be bottled, with proceeds from the sale donated to his charity, The Prince’s Foundation. Of the 206 individually numbered bottles produced from cask number 1129, a single refill American oak hogshead, 184 bottles will be sold via ballot through The Whisky Exchange for £1,470 each, with one additional bottle auctioned through whisky.auction on 3 February. Another bottle will be stored in the Diageo archives in Menstrie, while the remaining 20 bottles will be will be kept by The Prince’s Foundation for further fundraising. The funds raised from the bottles’ sale will support the work of the Foundation at The Carriage tearoom at Ballater Station on Royal Deeside. 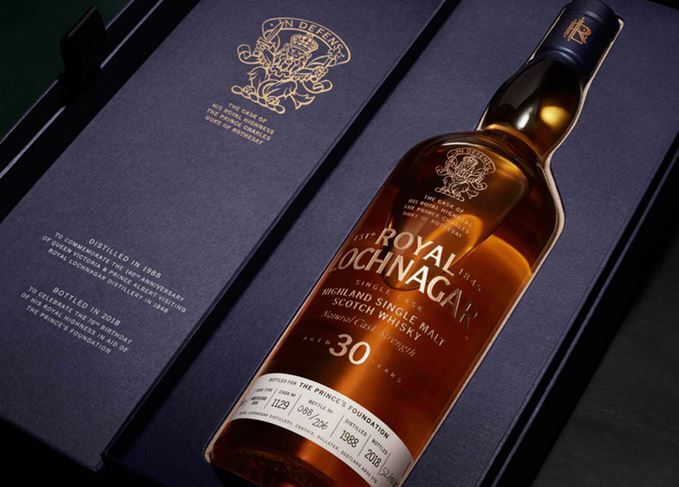 Royal Lochnagar 30 Year Old was distilled in 1988 and bottled in 2018 on 14 November – the Prince’s 70th birthday. Described as having ‘vanilla, pear and marzipan’ notes on the nose, with ‘blackcurrant, walnut and coconut’ flavours on the palate, the whisky has been bottled at a cask strength of 52.6% abv. Each bottle features the arms of the Duke of Rothesay – his Scottish title – with the words ‘The Cask of HRH The Prince Charles, Duke of Rothesay’ on its handwritten label. The ballot for the chance to purchase a bottle of Royal Lochnagar 30 Year Old opens on 31 December, and will run until 27 January 2019. Prince Charles was formally gifted the cask during a visit to Royal Lochnagar distillery in October 2018, where he sampled the liquid alongside Diageo blender Maureen Robinson and Sukhinder Singh, co-founder of The Whisky Exchange. Those interested in entering the ballot can register their details to be notified when it goes live on The Whisky Exchange website. HRH has requested the whisky, gifted to him upon a distillery visit, be bottled for charity.